Bradstone Azul slate is an authentic slate that incorporates a distinctive colour, that is in high demand amongst the UK residential market right now, and offers strength and durability. The naturally occurring slate originates from north-west Spain and every tile is different, textured and requires minimal grading. 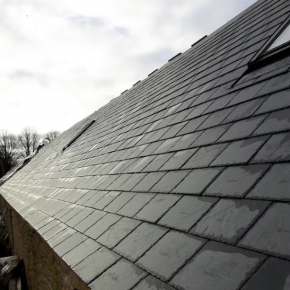 In addition, the slate can be used for residential properties, but can also be utilised for commercial buildings. Each Bradstone Azul slate measures 500 x 250mm, weights 1.1kgm and is 5-6mm thick. The full width units feature pre-drilled nailing holes and the slate is suitable for roofs down to a minimum pitch of: 27.5° moderate exposure and 35° severe exposure. Aggregate has researched and sourced the best quality material of the tiles, ensuring it is premium and will achieve an attractive finish.